"As Ben experimented, people peppered him with questions about electricity. Distracted, Ben was still holding the ends of two bare wires when the other ends touched the Leyden jars. A massive charge knocked him to the ground. When he clambered to his feet, he had to admit that his guests appeared to have enjoyed watching him get electrocuted." 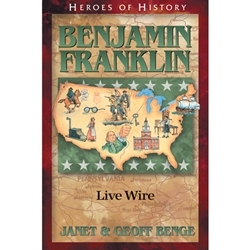 Benjamin Franklin's life never lacked excitement and intrigue. As a printer, writer, scientist, inventor, and American statesman, this spirited Philadelphia resident continually sought to improve himself and the world he lived in.